A two-sided emery file designed to file natural nails. The green side allows shaping of nails. The pink side is often used when patches are needed as well as dealing with stains and/or ridges from the nail surface. The green and pink side can shape nails. File in one direction. The pink side is ultra-fine and can be used in multiple ways. When stains and/or ridges are involved, apply Nailtiques Nail Moisturizer or Oil Therapy to the nail surface before proceeding. The emery is extremely fine and can be used more than once. 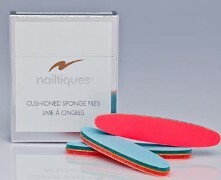 Nailtiques Brown Sponge File is a two-sided file with the same grit on both sides. It is about four inches long and is ideal for trimming and shaping nails. For best results, file nails when dry and in one direction.